About 20 miles southwest of Vernal, UT is the Bureau of Land Management's campground on the southern shore of Pelican Lake. I traveled there in the Tank to camp for a week in mid-August and came away fairly impressed with what I found. 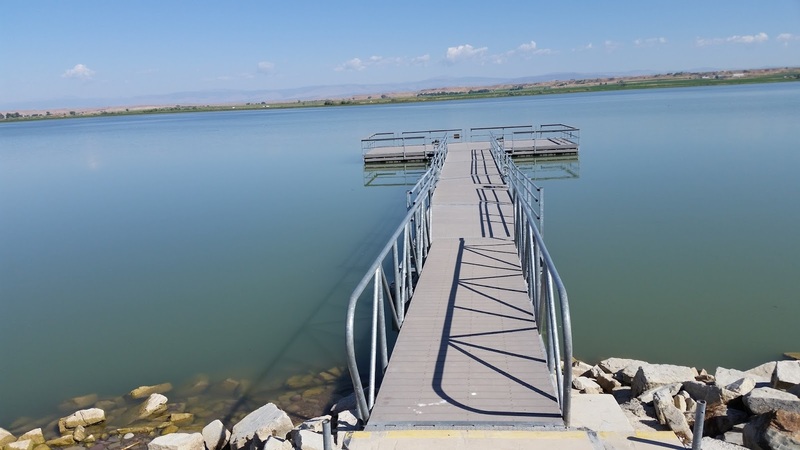 At an elevation of 4800 feet Pelican Lake is a natural lake lying within Utah's Unita Basin. 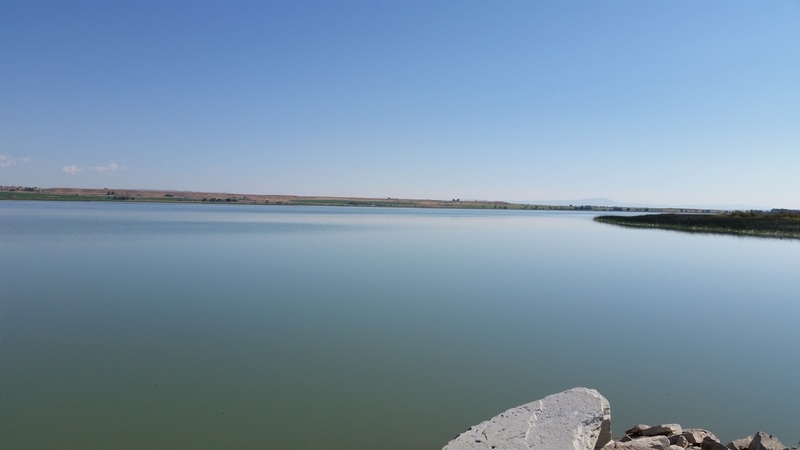 The lake has been dammed to store and release water for irrigating the extensive farmland surrounding it. 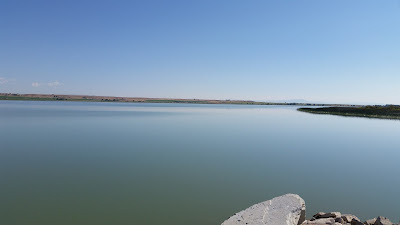 To keep it from being drained water is diverted via canal from the Unita River into Pelican Lake. Pelican Lake is a pretty good-sized body of water. 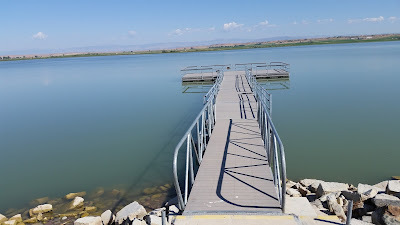 The lake is known for it's bluegill fishing and there were locals fishing from boats and also the BLM built fishing pier every day I camped there. The pier gets boat-less fishermen out to fairly deep water. 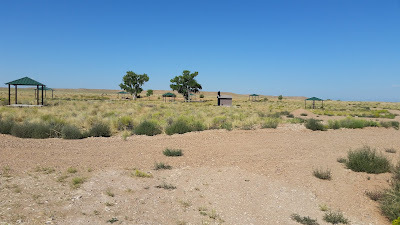 Unlike most BLM camping areas the Bureau constructed a campsite loop with gravel back-in driveways complete with fire rings and picnic tables with gazebos covering them. I didn't stay in the loop because there were sites closer to the lake that had probably been there prior to the more formal campsite loop. 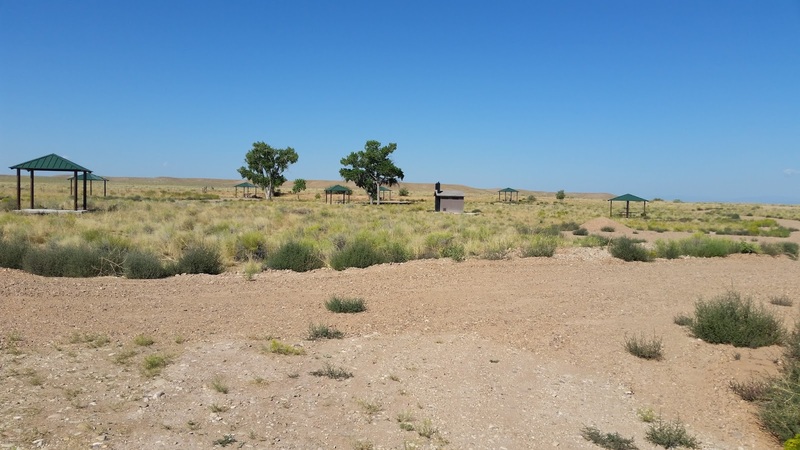 BLM campsites on a road loop. 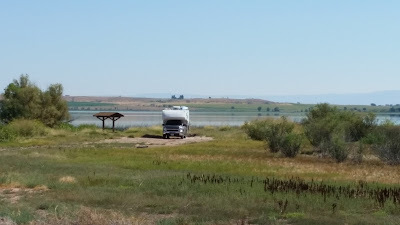 "Swimming is not recommended do to Swimmer's Itch..."
I had wondered why I was the sole camper at the lake my whole time there, thinking that the camping loop would be perfect for family campouts but perhaps the inability to swim precluded parents wanting to bring kids there. Pelican Lake Recreation Area was a great place to camp and fish and I'd put it on my "Will Return" list. 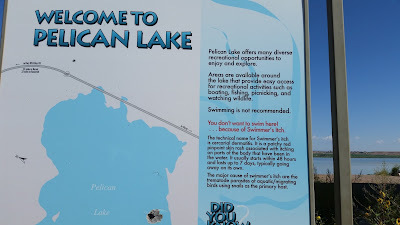 It's too bad about the Swimmers Itch but, truthfully, I seldom swim when I camp so that wasn't a deal breaker for me. 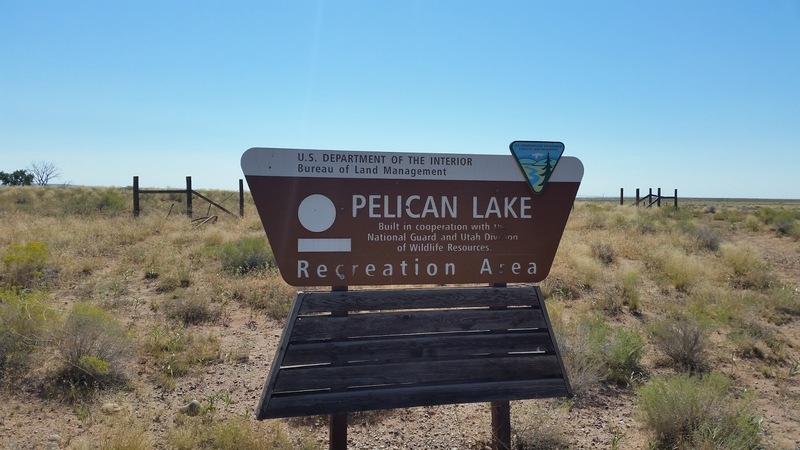 I recommend camping there especially if you like bluegill fishing.